LAS VEGAS – The final presidential debate at the University of Nevada, Las Vegas (UNLV) generated nearly $114 million in publicity for Las Vegas and the university.The figure is more than double the original projection anticipated by the host agencies. The Oct. 19 debate at UNLV’s Thomas & Mack Center was the third most watched in history, attracting more than 71 million television viewers. The figure does not capture individuals who streamed the debate online or through mobile devices. It was the first time in history that Nevada hosted a general election debate. 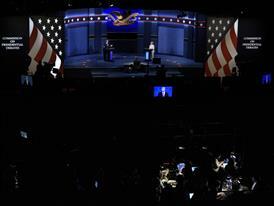 Approximately 5,000 members of the media from national and international outlets converged on Las Vegas to cover the debate. The university and its partners conducted more than 500 interviews related to the presidential debate and election, highlighting faculty experts, students and community leaders. Television networks CNN and MSNBC broadcast live programming from the heart of UNLV’s campus the day before and day of the debate, and Fox News Channel broadcast live from the Las Vegas Strip for an entire week. UNLV President Len Jessup and LVCVA President/CEO Rossi Ralenkotter welcomed debate attendees and viewers with overviews of the university and the destination that CNN and C-SPAN networks televised live. The final debate in the 2016 election was a partnership between UNLV and the LVCVA. The cost to produce the debate was approximately $7.5 million, which was offset by more than $1.4 million in gross revenue from sponsorships, exhibit booth space, and catering. The LVCVA had authorization to expend up to $4 million on debate costs with UNLV absorbing the remaining expenses. Separately, the university also invested nearly $1 million in expenditures as the host site for items such as Wi-Fi enhancements, fiber extensions, facilities maintenance and campus marketing signage, as examples. Many of these items have ongoing application and benefits for the campus. At UNLV, more than a dozen special debate and/or election-themed courses were developed, national experts delivered a special lecture series, close to 1,000 students signed on to volunteer for debate-related activities (with several hundred inside the perimeter on debate day), and more than 200 students were able to experience the debate in person. Student journalists covered the debate from the media center, and hundreds of students attended watch events throughout campus on debate night. UNLV and LVCVA also formed a strong partnership with the Clark County School District, working with the district on an essay contest for high school students, special watch events where middle and high school debate teams interacted with UNLV’s nationally-ranked squad, and on curricular opportunities for younger students. Traffic on the UNLV website on debate day was as much as 10 times higher than normal, and international visitors were more than triple the average. Admission page views increased 87 percent. Facebook followers in October were 113 percent higher than an average month and Twitter followers were 73 percent higher. Instagram had 176 percent more engagements. Hosting the debate confirmed Las Vegas’ reputation as more than just a leisure destination, but also as a serious place to do business. UNLV is a doctoral-degree-granting institution of 29,000 students and 3,000 faculty and staff, and ranks as the second most diverse university in the nation for undergraduates. Founded in 1957, the university offers more than 220 undergraduate, masters and doctoral degree programs. UNLV is located on a 332-acre campus in dynamic Southern Nevada and is classified in the category of Research Universities (high research activity) by the Carnegie Foundation for the Advancement of Teaching. For more information, go to www.unlv.edu.